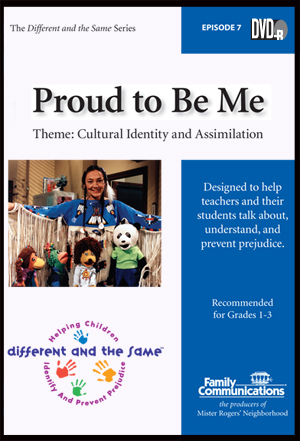 Your students will capture the importance of recognizing the value of cultural differences as they learn that people can identify with and belong to their own culture, while being a part of mainstream culture. In a “What doesn’t belong in this group?” exercise, Arthur says Cat-a-lion doesn’t belong because of his cultural differences. Ms. Ahenakew returns to class dressed in the traditional clothing of her Native American people. The puppets conclude that she looks very different, but is still their familiar teacher. She explains that she was teased as a child, but came to realize that being a Native American is special. The puppets decide to share their cultures with one another. Activities:Celebrate differences with cultural show-and-tell, grouping exercises, and a heritage festival.